Anyone who owns a car knows how expensive car insurance premiums can be. On average, car owners are paying more in premiums than for the maintenance of the car. Your age, gender and state you live in, all play into the insurance premium you are given. With that being said, there are things you can do to help lower your rate. Below are 10 tips to help you bring down your insurance premium. Insurance policy rates can really vary from one company to the next. What may be the best buy for one person may end up being more expensive for you. In order to find the best car insurance company for yourself , you need to shop around and get quotes. There are plenty of sites you can go onto and enter your information along with the type of coverage you are looking for. You will then be given quotes from various companies. Happy with your current insurer? The lower price can be used as a negotiation tool. Most companies will match the quote or come down on their price for you. You may not think so, but your credit score plays a role when insurance companies are assessing your risk level. People with a higher score tend to have less accidents. You can get your credit score for free from a number of sites and if you find your number to be lower than expected, contact a credit repair company to help you find and fix any errors. By law, liability insurance is the only auto insurance you need. It pays for any injuries or car damage the other driver receives. Many people, though, opt to add on a lot of extra features to their policy which can really jack up your premium. Things like collision coverage and comprehensive coverage can add up to $2k dollars to your policy. If your car is older, this really does not make sense for you since you will most likely never get your money's worth. Look into the what your vehicle is worth. Anything less than 10 times what you are paying for the extra features is not a good deal. A much better idea would be to get rid of the coverage and save the money for when your car may need it. Uninsured motorist ( you receive damages if you're hit by an uninsured driver) is another feature that may not be necessary. If you already have health insurance, any medical costs would be covered. Increasing your deductible is another way you can save some money. This represents the portion you cover for any repairs resulting from an accident. The bigger the deductible, the less you pay in premiums. You can reduce it anywhere from 25%-40%. Now, if you get into an accident, you do need to have that extra money accessible for repairs. You should to take the money you are saving on your premium and put it aside for repairs. Just like health insurance, some employers may offer group insurance. By insuring a group and not each individual, the insurer saves money and that passes onto you. Bigger companies are the ones that tend to offer this type of perk since the more employees, the bigger the savings. Some alumni associations and other professional organizations may offer group insurance too. If you belong to any, inquire. Keep in mind though, that you do not get to choose the insurer and if you leave the job, you lose the policy. Add on one or more policies. Sometimes adding on your homeowners insurance, for example, can save you up to 20%. With that being said, you may also find that it ends up being more expensive but it is worth checking into. Insure multiple vehicles. 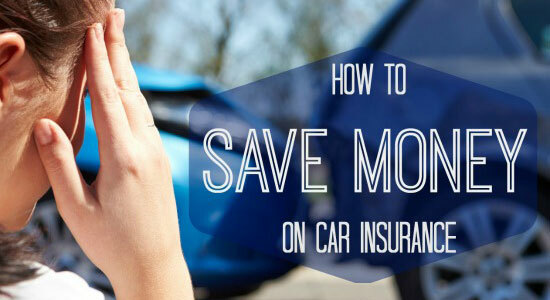 Having two cars insured on the same policy can cost up to 10%- 25% less. Everyone in the household should be on the policy. Anyone of driving age in the house should be on the policy minus anyone with a tainted driving record. More miles can equate to more chances of an accident. For this reason, insurance companies offer a low mileage price break to those that don't drive as much. If you drive, for example, only 5k miles per year, you can save around 8% compared to those driving 15k per year. If you do not qualify for the discount, see what number you need to be at. Carpooling or riding your bike to work are ways you can save hundreds on miles. If you really keep driving to a minimum, you can look into pay-per-mile insurance. Metromile and Esurance both offer a pay-per-mile plan that is recommended for people who do not drive much per year. Having good grades. Typically, young drivers get very high rates. If you have good grades in high school or college, you may be entitled to a discount. Being 55 and older. If you are 55 or older, you may qualify for a discount. Safety features on your car. Insurance companies like safety features since it lowers the chance of you making a large claim. Features like anti-lock brakes, airbags, anti-theft systems etc, all apply. Stay with the same company. Some companies offer discount if you have been with them a while. Pay your bill up front. If you pay your premium monthly, a processing charge is most likely being tacked on. Pay your premium in full and you avoid this charge. Your driving record is of course also key in getting you the best insurance rates. Tickets and accidents are the single most important factor affecting the rate you get. Any serious traffic violation will cause your rates to remain high for up to 3 years. This also applies to any accident where you are at fault. The key takeaway here is to be the safest driver possible. Slow down, never drive under the influence, only drive when rested and avoid distractions. Price: Insurance companies have more to lose if an upscale car is damaged. Repair costs: Beware of fancy cars with costly repairs. This adds to the cost an insurer will be required to pay in the event of an accident. Level of safety. Showy cars are regarded as risky since those that buy them typically like to drive fast. A family car, on the flip side, will most likely be driven at a slower speed and will fare better in a accident. Be sure to check the crashworthiness of certain car models. Likelihood of Theft. It is not just the expensive cars that thieves target. Many cheaper models can be the target for their parts. Do some research on the most stolen cars before getting your next car. When it comes to insurance companies, the number of discounts does not always mean you are getting the best deal. If their premiums are higher from the get go, it will not make a difference. Keep in mind your own personal factors like where you live, age and the type of car you drive. By doing this, you will get a fair comparison and see which policy has the best rate.